June 27, 2016 – NASA’s Juno spacecraft obtained this color view on June 21, 2016, at a distance of 6.8 million miles (10.9 million kilometers) from Jupiter. The scene was captured by the mission’s imaging camera, called JunoCam, which is designed to acquire high resolution views of features in Jupiter’s atmosphere from very close to the planet. As Juno makes its initial approach, the giant planet’s four largest moons — Io, Europa, Ganymede and Callisto — are visible, and the alternating light and dark bands of the planet’s clouds are just beginning to come into view. 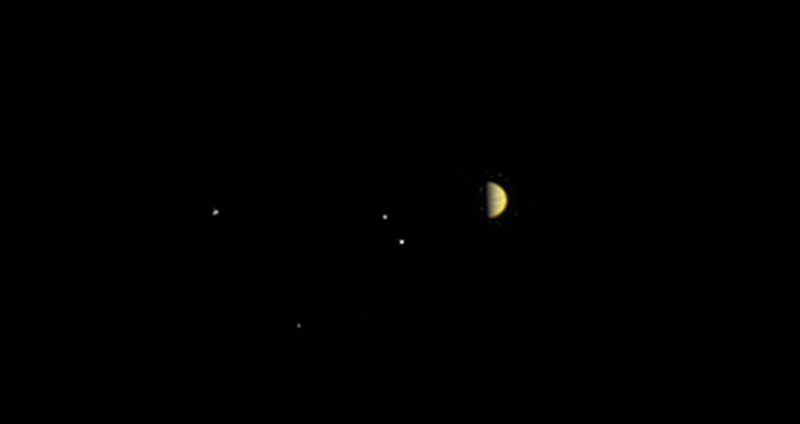 Juno is approaching over Jupiter’s north pole, affording the spacecraft a unique perspective on the system. Previous missions that imaged Jupiter on approach saw the system from much lower latitudes, closer to the planet’s equator. Juno will arrive at Jupiter on July 4, when it will begin a year-long mission to probe beneath the obscuring cloud cover of Jupiter and study its auroras to learn more about the planet’s origins, structure, atmosphere and magnetosphere. NASA’s Jet Propulsion Laboratory, Pasadena, California, manages the Juno mission for the principal investigator, Scott Bolton, of Southwest Research Institute in San Antonio. The Juno mission is part of the New Frontiers Program managed at NASA’s Marshall Space Flight Center in Huntsville, Alabama. Lockheed Martin Space Systems, Denver, built the spacecraft. Three researchers and five students from CU-Boulder’s Laboratory for Atmospheric and Space Physics (LASP) are also part of the Juno mission. CU-Boulder Professor Fran Bagenal of LASP, co-chairs the Juno Magnetospheric Working Group for NASA and is coordinating many of the science observations for the mission.